This page contains mods and other non-commercial games and projects I have worked on throughout the years. A map pack for UT3 that I directed and organized. The pack contains nine levels with a very strong focus on competitive gameplay, and minimalstic looks. The pack was well received and spawned a number of follow-ups. A large singleplayer total conversion for Unreal Tournament. I was a texture artist for this mod. Included in Epic Games' official ECE Add on pack. 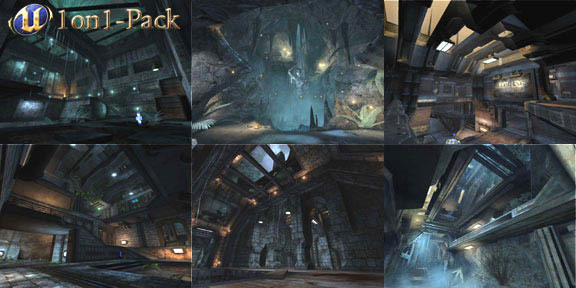 A 1on1 DM mappack for UT2004 that contains six small DM levels. Two of those were made by me, Sae and Argel. A gigantic singleplayer MOD for Unreal Tournament. The mod has more than 40 singleplayer levels, more than the original Unreal. The mod continued on the story and art style set by Unreal, and was downloaded over 250.000 times. A large singleplay MOD for UT, set in a parallel world to Unreal, with a number of new features. With over 17 singleplay maps it is one of the biggest singleplay campaigns for UT and Unreal that are around. The mod was made by just three people. A multiplay MOD for UT. The goal in the MOD is to send the enemy team to a jail and making sure that they cannot capture your team. I created the level Raid for the mod.